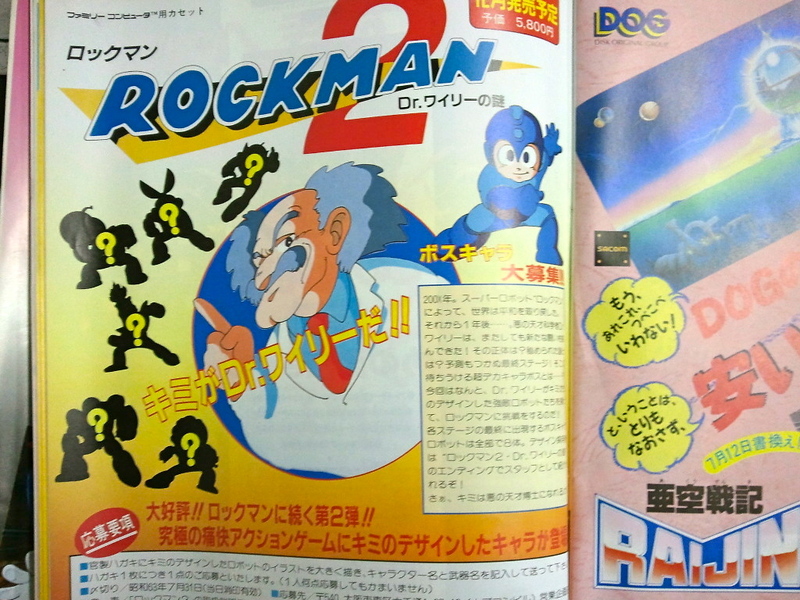 This is an ad for Rockman 2's boss contest from the pages of an old issue of Family Computer Magazine. I randomly found this in my travels and, well, it's pretty darn cool. For starters, it's history. The practice of "recruiting" children to design bosses would become a series staple for the following two decades. And it all began with this. The premise here is pretty straightforward: YOU are Dr. Wily. It's your responsibility to whip up a snazzy robot and hope it makes it into the game. Interestingly, the contest left Keiji Inafune and his team only four months to choose a design and program all eight Robot Masters before the game's release in December (talk about cutting it close!). The logo used in the ad is pretty interesting in itself, too. You'll recognize it from Rockman 2's beta cartridge. Rad colors, wouldn't you say? I'm a big fan of old magazine content, so if you happen to stumble upon other neat things like the above, give me a holler. Rockman 2's beta cartridge link isn't working anymore. By the way, good job!